For three years, the BE Festival has brought gems to Birmingham’s Jewellery Quarter. Harvesting 20-odd shows from across Europe, it serves up an eclectic programme around a big, communal meal. The idea is to encourage genuine cultural exchange, between artists and audiences, as well as nations. Now it’s going walkabout. Following a strong Edinburgh Fringe mini-season, it’s replicating the festival formula on tour: Three cherry-picked shorts – all festival favourites last year – are performed either side of a decent feed. It’s a fantastic way to support emerging artists and showcase delicate work. See them in isolation and you might feel short-changed. Together, they more than add up – especially with the festival’s eclecticism remaining intact. There’s screwball circus, pulsating contemporary dance and goofy, soulful physical theatre on show. Al Cubo by French outfit BettiCombo is the slightest piece: an unlikely combination of Chinese pole and bucket juggling. A well-matched trio of performers – one sensible, one reckless and one the mother of all showboaters – construct a 20-foot tower of plastic white buckets, only to bring it crashing down. They chuck the buckets around as if playing an outsized version of Find the Lady – until yet another smashes underfoot and their coy clean-up operation begins again. You get a lovely sense of the pointlessness of it all, but it needs rat-a-tat slickness to really fly and more elegance on the pole to balance. Tao Te starts with two men and a baguette. Each eats their own chunk and eyes up the other’s. The dance that follows – an undulating, bungee-jointed freestyle – explodes into life. It’s as if this cagey suspicion exists across an entire city: in dole queues and changing rooms, between manual workers and city slickers. 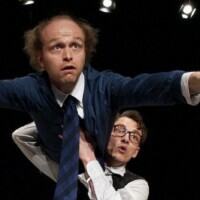 Hungarian choreographer Ference Fehér and Balázs Szitas – two human Slinkys – constantly remake their relationship; sometimes sparring, sometimes supporting one another, finding the folds of each other’s bodies. It’s a riveting piece of choreography that speaks to its audience without relying specialist vocabulary. Next Door by Copenhagen’s Out of Balanz best encapsulates the festival’s welcoming spirit. When a Dane and a Finn can be best friends and cultural references from Superman to Star Wars are borderline universal, how we can go without knowing our neighbours? Or lose touch with childhood friends? This lovable physical comedy might be a mite nostalgic, but its boyhood bike races and imaginary battlefields are played with such flair and attention that you can’t help but give in.